Migrant Children: Inside The Homestead, Fla. Shelter Facility A temporary shelter has been contracted south of Miami to house more than 2,000 migrant children. 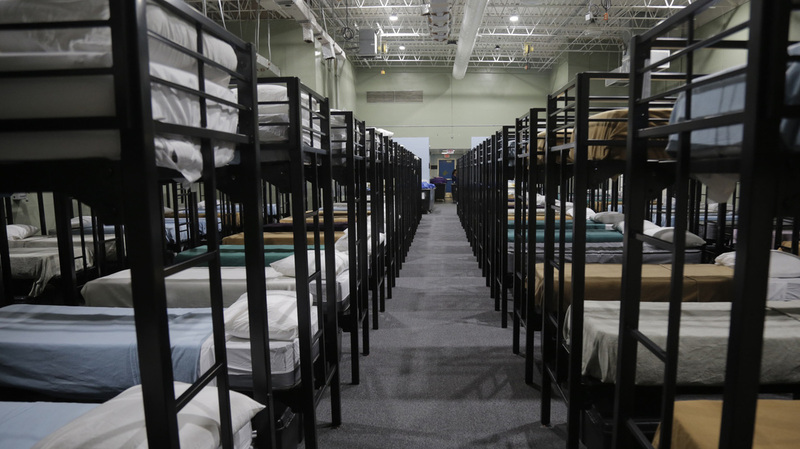 It is the nation's only corporate, for-profit migrant youth shelter. 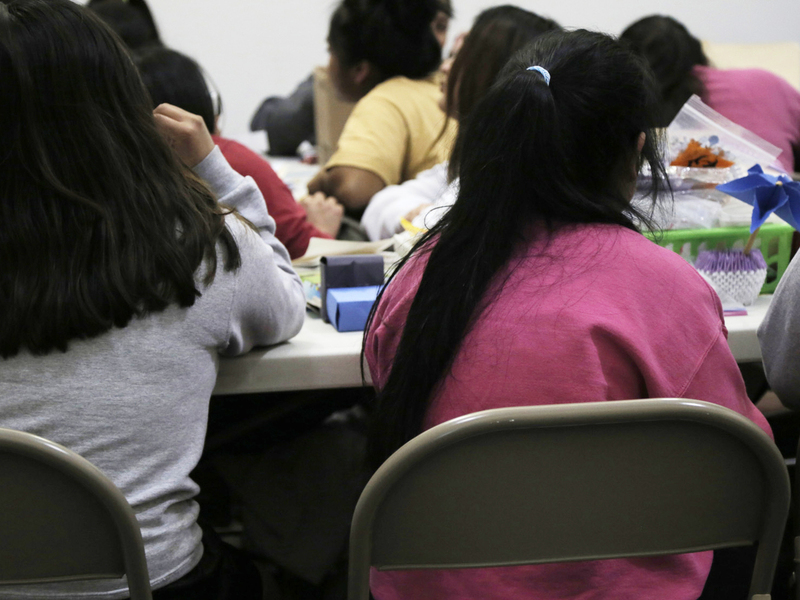 Nearly 1,600 teenage migrants are housed at a temporary emergency shelter in Florida run by a for-profit company. Thousands of migrant children continue to arrive at the Southern border every month, without their parents, to ask for asylum. The government sends many of them to an emergency intake shelter in South Florida. That facility has come under intense scrutiny because it's the only child shelter for immigrants that's run by a for-profit corporation and the only one that isn't overseen by state regulators. The Homestead "temporary influx facility" is the biggest and most controversial shelter for migrant children in the country. Critics say the government is warehousing kids in a makeshift prison camp. But on a recent tour, the shelter director took pains to show a different perspective. The kids, ages 13 to 17, live in sand-colored dormitories, amid palm trees and bougainvillea, inside a fenced campus next to Homestead Air Reserve Base, south of Miami. The tour guide showed off the soccer field, the phone-home room, the medical clinic and the school classrooms. She described holiday parties, talent shows and pizza and ice cream for good behavior. The Homestead "temporary influx facility" for migrant children is located next to the Homestead Air Reserve Base outside Miami. The young immigrants, mostly from Central America, receive health and dental checkups, new clothes and hygiene kits. They're assigned a case manager with whom they work to get released to an adult sponsor. Discipline is strict. The teenagers walk single file in groups of 12, escorted by a youth-care worker. They smile at a visitor and call out "hola" when greeted. But that's all a reporter ever hears. On these visits, journalists are not permitted to record anything, take photographs, or speak to the children. It's for the minors' privacy and protection, officials say. Several days after the tour, a group of attorneys agrees to sit down and describe their interviews with two dozen of the migrant children. They have been granted access to these shelters by a federal judge to oversee the welfare of unaccompanied kids in federal custody. We see a very different picture than the reporters see. "We see a very different picture," says Leecia Welch, senior director of legal advocacy and child welfare at the National Center for Youth Law. "We see extremely traumatized children, some of whom sit across from us and can't stop crying over what they're experiencing." She continues, "We hear stories of children who are told from the first day of their orientation that under no circumstances can they touch another child in the facility, even their own sibling, even friends who they're saying goodbye to after many months of shared intense experience. They can't hug them goodbye. If they do, they're told they will be written up and it could affect their immigration case." Welch concludes, "We see a very different picture than the reporters see." The tour guide showed off the phone-home room at the Homestead "temporary influx facility." Homestead is like no other federal children's shelter in America. Not only is it the biggest — it has been contracted to receive up to 2,350 kids — it's the only youth sanctuary operated for a profit. The operator is Comprehensive Health Services. The Florida-based company dispatched medical teams to the Gulf Coast after Hurricane Katrina, to Haiti after the earthquake, and to Balad Air Base in Iraq. And in 2016, it entered the migrant shelter business. The current Homestead contract with the Department of Health and Human Services is worth up to $220 million. The average daily cost to care for a child at an influx facility is about $775 a day, according to Evelyn Stauffer, press secretary at the U.S. Department of Health and Human Services. With nearly 1,600 children at Homestead, that puts the burn rate at over $1.2 million a day. The average cost for a migrant child at one of the 130 smaller, permanent shelters contracted to HHS is about a third of that. "The cost of a temporary shelter is significantly higher because of the need to develop facilities quickly and hire significant staff over a short period of time," Stauffer wrote in an email to NPR. Jonathan Hayes is the acting director and chief of staff of the Office of Refugee Resettlement, which oversees the shelter network. "At times due to just migration patterns," he explains, "there is a need to have temporary influx shelters such as Homestead. I'd rather have capacity available and not need it, than to need it and not have it." Immigrant advocates fear that America's prison-industrial complex is now expanding into federal child custody. "From what I understand, it's the first for-profit child detention center," says Maria Rodriguez, executive director of the Florida Immigrant Coalition. "So just let that sink in." Company executives declined to be interviewed. But a Comprehensive Health Services vice president said in an email that "the safety and welfare of unaccompanied minors at the Homestead facility is a top priority" and that they follow all laws and every new hire is fully screened. In announcing its initial public offering in filings with the Securities and Exchange Commission last fall, Homestead's parent company, Caliburn International, states that the Trump administration's "border enforcement and immigration policy ... is driving significant growth." The company also warns investors that the "challenging and politically charged environment" could "adversely impact our share price." "Caliburn's SEC filings make it clear that they understand the controversial nature of the policies that they are benefiting from," says Kevin Connor, director of Public Accountability Initiative, a watchdog research group that has looked into Caliburn's IPO. Dormitory beds for migrant children at the Homestead "temporary influx facility" outside of Miami. Meanwhile, the migrant kids keep coming. In January, the Border Patrol reported more than 5,000 "unaccompanied alien children" apprehended at the border, almost all from Guatemala, El Salvador and Honduras. Once in federal custody, they are sent to Homestead or to one of the 130 smaller permanent shelters. ORR insists that its mission is child welfare, not immigrant detention, which is the responsibility of Immigration and Customs Enforcement. Jonathan Hayes of ORR says the shelter facilities are a far better environment than the austere holding cells at the border. "The main mission is to ensure kids are not stuck in true detention facilities and cages in Border Patrol stations. That's the goal of all of us here at ORR and our grantees. We want to get these kids into our shelters as safely and quickly as possible, without delay," he says. 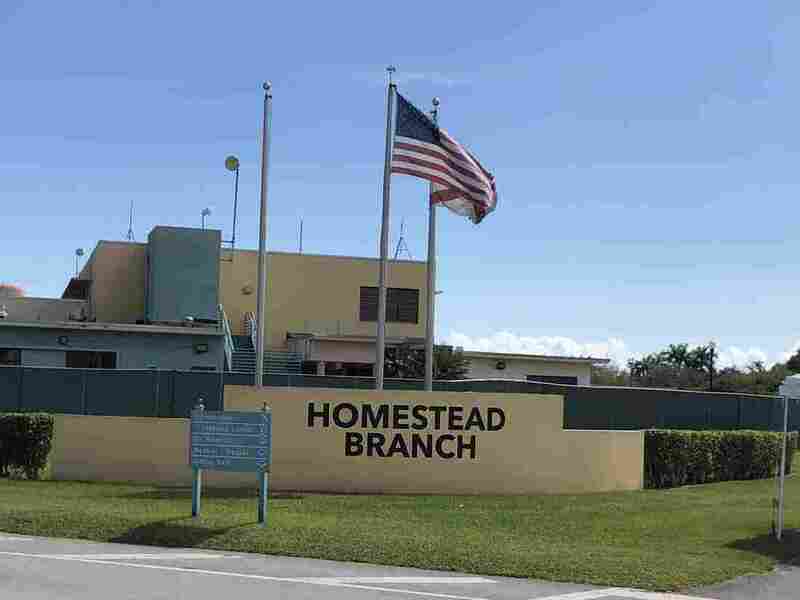 But immigrant advocates say the kids are kept at those shelters for too long — an average of 67 days at Homestead — before they're released to live with a sponsor and wait for a court date. And they want the facility closed. Now Democrats have introduced legislation in Congress that would do just that. It's called the Shut Down Child Prison Camps Act. Another sprawling emergency shelter, the Tornillo tent camp in the West Texas desert, closed last month amid incendiary criticism and the nonprofit operator's desire not to renew the contract. 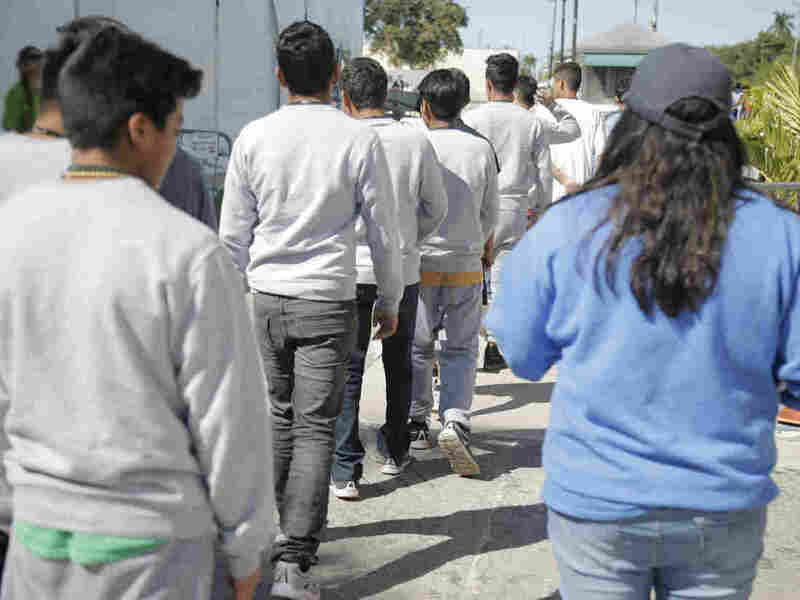 "There is absolutely no basis for detaining children at an influx facility for months and months on end," says Neha Desai, director of immigration at the National Center for Youth Law. Homestead is unique because it's a temporary overflow facility on federal property. That means the shelter doesn't have to be licensed by the state and follow Florida child care standards, though it does have to comply with federal regulations. Migrant children attend classes at Homestead. Miami's school superintendent is angry that he is not allowed to inspect educational services inside the facility. Being on federal land also means the shelter does not have to be part of the local public school system. The shelter director says the children receive proper educational services, and showed a reporter an instructor teaching English to a full classroom. But Alberto Carvalho, superintendent of Miami-Dade County Public Schools, says there's no way to verify the quality of education. "For me this is personal," he says, explaining how he came to the U.S. as an unaccompanied immigrant from Portugal at age 17. He rose to become chief of the nation's fourth-largest school district, which is predominantly immigrant. Now he's angry that the federal government is telling him he cannot inspect Homestead's classrooms. "For me to now be running a school system and not take a position to fight for the educational rights of kids, regardless of immigration status, would be the equivalent of me turning my back on myself," Carvalho says. But all the criticism hasn't hurt business. In the past two weeks, Comprehensive Health Services has been issued new state licenses for three permanent shelters in South Texas to hold 500 migrant children for the U.S. government.